Give a traditional touch and luxurious look to your home by placing this gorgeous carpet which contains Kashan design pattern. Kashan design has been originated from Persia in the 19th century. 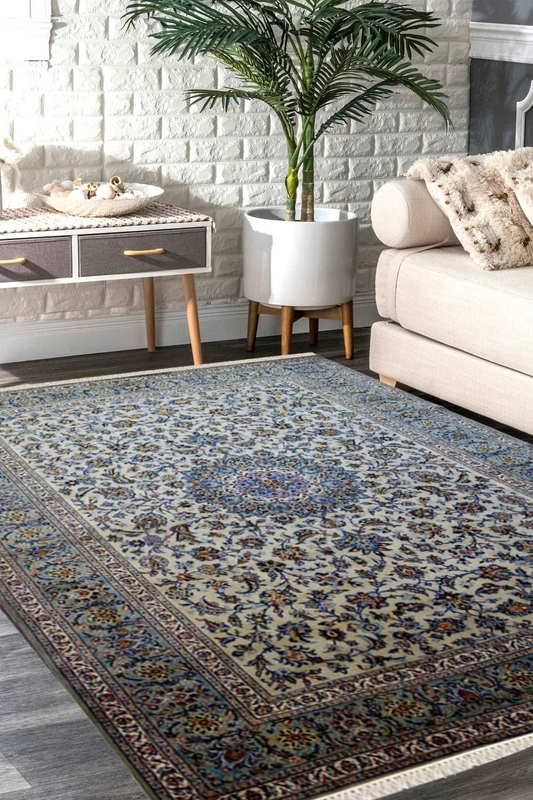 With the perfect shades of ivory and blue color with different suitable and matching colors like dark blue and tings of yellow, this pure New Zealand wool and finest quality of cotton rug from India is hand-knotted beautifully to give your living area a lavish and magnificent look. With the luxury of traditional art, this rug from India is sure will make a unique attraction for your guests. Buy this pure wool area rug from Rugs and Beyond at cheaper price. The design is Kashan which has been originated from Persia in 17th century. This is very old and traditional design pattern. It is a pure Persian Carpet.